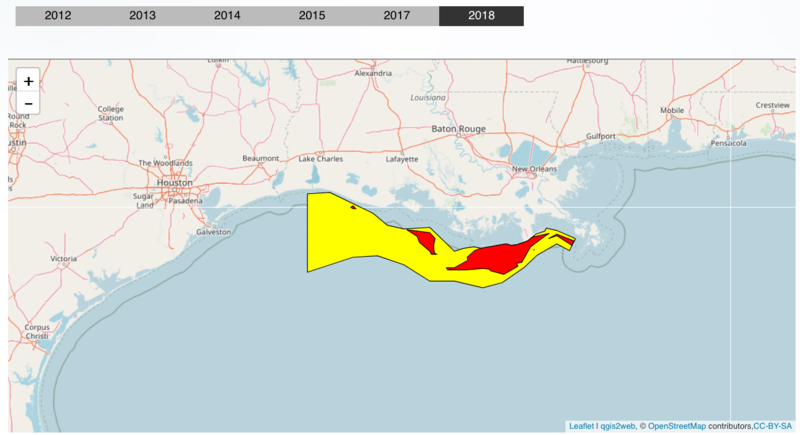 An oxygen-poor “dead zone” in the Gulf of Mexico, which can prompt harmful algae blooms and threaten marine life, could approach the size of New Jersey this summer, federal scientists say — making it the third-largest the Gulf has seen. A new forecast from the National Oceanic and Atmospheric Administration predicts that the annual dead zone will reach an area of nearly 8,200 square miles in July, more than 50 percent larger than its average size. While the Gulf dead zone occurs each summer, brought about by human pollution running into the water, scientists and policymakers are fighting to reduce its size. It’s a big priority because of the dead zone’s potential to damage fisheries, according to NOAA scientists — and this year’s unusually large forecast may mean even more of the Gulf is at risk than usual. “We’ve known for a long time that the hypoxic zone reduces fish and shrimp habitat dramatically,” said Alan Lewitus, a scientist with NOAA’s Center for Sponsored Coastal Ocean Research. (“Hypoxic” means deprived of oxygen.) Even if the low-oxygen levels don’t outright kill the fish in the water, exposure to these conditions can harm their ability to reproduce, change their migration and feeding patterns and stunt their growth. And these effects can have a negative impact on the economy as well. 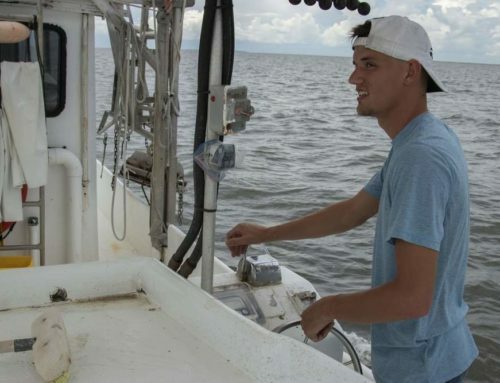 A study published this year found that dead zones in the Gulf of Mexico can cause large shrimp to become scarce and smaller ones to become more abundant. As a result, the price of large shrimp climbs while the price of small ones drops, causing a disturbance in the market. Scientists have been monitoring the size of the Gulf dead zone every year for the past 32 years. 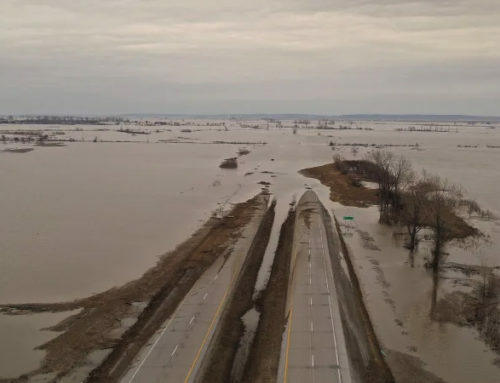 It’s caused mainly by nitrogen, phosphorus and other nutrient pollution — largely produced by human agricultural activities — running into rivers that eventually empty into the Gulf. In the summer, when the water is warm, the excess nutrients in the water can contribute to large bursts of algae growth, which can lead to low-oxygen conditions in certain parts of the Gulf. Typically, the dead zone hovers off the coast of Louisiana and eastern Texas, and its average area spans about 5,300 square miles. Each year, NOAA scientists create a forecast for the coming summer’s dead zone, based on nutrient runoff data collected by the U.S. Geological Survey. In July, when the dead zone generally reaches its peak, scientists confirm its actual size with boat surveys. Since the early 1990s, Lewitus said, there’s been an increase in the size of the annual dead zone, although in recent years it’s begun to plateau. A coalition of state and federal partners is working to try to shrink it again. 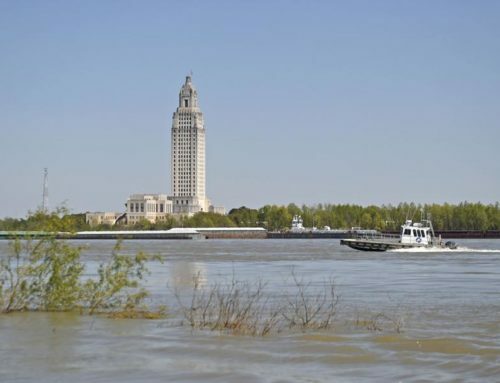 The Mississippi River/Gulf of Mexico Hypoxia Task Force was established in 1997 to work on understanding the causes of the Gulf dead zone, cutting down on nutrient pollution and reducing the dead zone’s severity. It’s been slow going. The task force’s most recent action plan, released in 2008, set a goal of reducing the summer dead zone to an area of less than 2,000 square miles by 2015. But in 2015, seeing that the plan was falling short, the task force moved its target to 2035. It remains difficult to assess how much progress is being made. 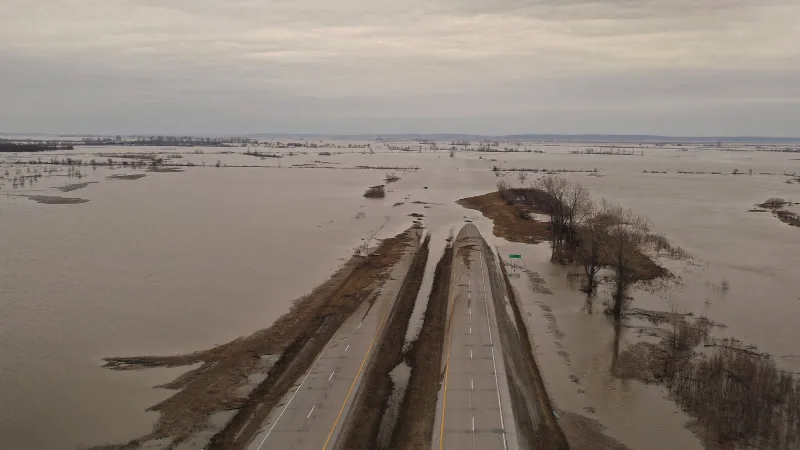 While there’s been no significant reduction in the size of the dead zone, Lewitus noted that some USGS data trends suggest that the amount of nutrient pollution is starting to decline. 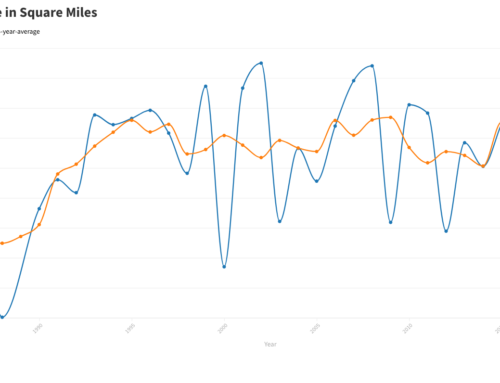 If that’s the case, and the trend continues, a reduction in the dead zone should follow shortly. 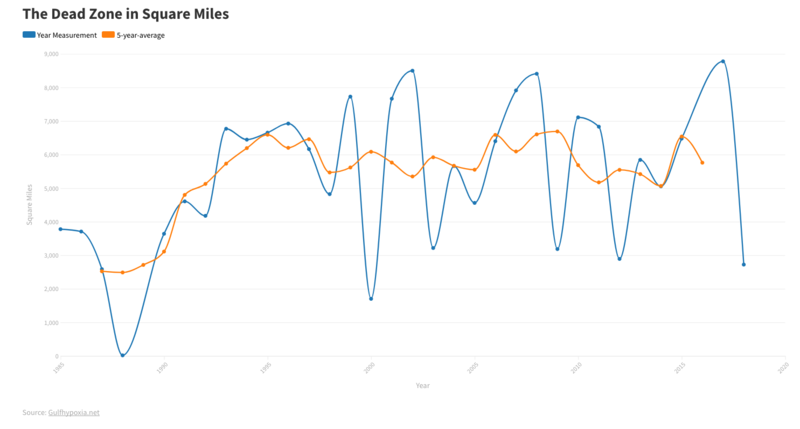 This year, though, heavy nutrient flows in May led to the higher-than-average forecast. The USGS data indicates that more than 360 million pounds of nitrogen and nearly 50 million pounds of phosphorus flowed into the Gulf last month. And while the NOAA forecast predicts the third-largest dead zone on record this summer, other scientists believe it may be even larger. 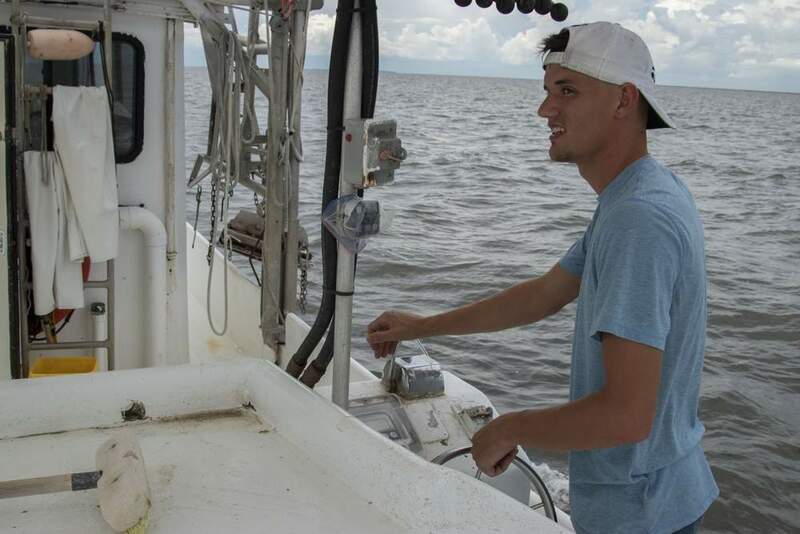 A separate forecast, produced by researchers Gene Turner of Louisiana State University and Nancy Rabalais of the Louisiana Universities Marine Consortium, predicts a dead zone covering more than 10,000 square miles — which would be the largest the Gulf has seen. The model used to make this prediction is one of several that NOAA uses in its own forecast, according to Lewitus, and the NOAA forecast is typically more on the conservative side. We won’t know for sure how large the dead zone grows this year until scientists complete their field survey later this summer. Between now and then, there are several factors that could affect scientific measurements when the time comes — mainly severe storms or high winds, which could churn up Gulf waters. 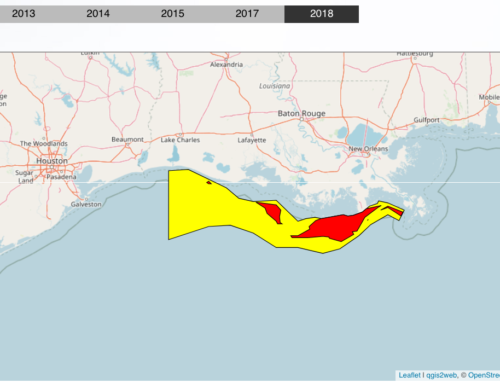 But for now, the region appears to be on track to see one of its most severe dead zones on record, underscoring the need for continued efforts to reduce pollution and protect water quality in the Gulf states.